I’ve been to Mammoth Cave once myself, in 2009 while visiting Kentucky for DaigaCon, an anime convention. It was raining nonstop, and the gray sky hung over a beautiful but gloomy green landscape of sinkholes and creeks and low hills; when I realized just how many caves were in the area (practically every freeway stop advertised one) I felt like I was walking on top of a giant sponge. 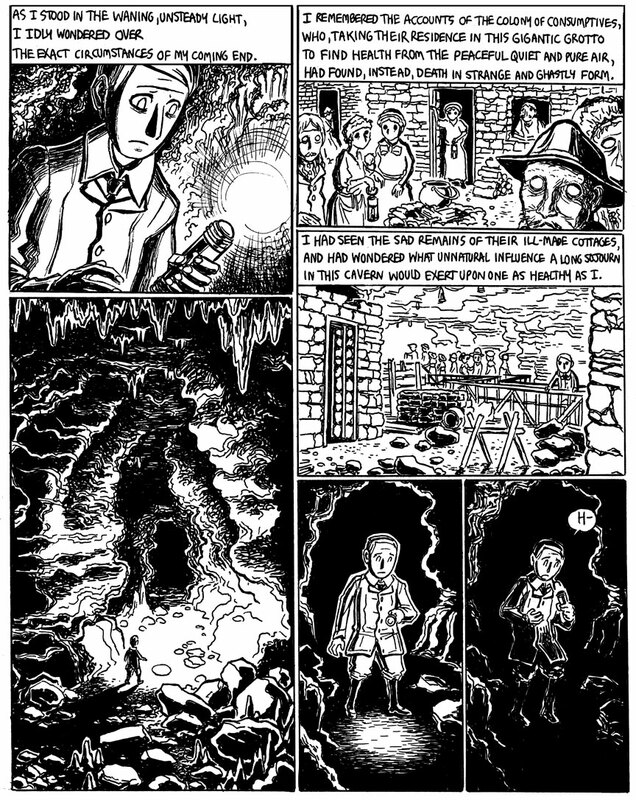 At the time Lovecraft wrote this story, around 1906, the “Kentucky Cave Wars” were just beginning, and Mammoth Cave was beginning to become the focus of massive tourism and entrepreneurship. This commercial exploration/exploitation resulted in several infamous deaths as people died trying to find or expand cave entrances. I wonder what specific magazine article, book or encyclopedia entry inspired teenage Lovecraft to write this story. I managed to get away from the convention long enough to go on a cave tour, and the first thing that struck me was the obvious: real-life caves, unlike the ones in D&D, aren’t designed to be traversed by human feet. While there were long galleries of relatively flat and stable corridors, what really stuck in my mind were the great gulfs of slippery limestone formations going down, down, down, with only manmade walkways and staircases created by the National Park Service preventing you from sliding down to the depths below. Spelunkers are incredible. On a totally different note, I’ve got work in an upcoming comic anthology: Anything That Loves: Comics Beyond Gay or Straight from Noethwest Press. The theme of the collection is nonbinary sexuality (bisexual, queer, whatever you call it), and I’m contributing a 16-page story. It’s not an adult anthology, and my story will be PG-13-ish. Currently, the anthology is the focus of a Kickstarter campaign, so if you’re interested, why not go over and reserve a copy? Other contributors include Erika Moen, Ellen Forney, Roberta Gregory, Bill Roundy, Mari Naomi, John Lustig, and basically, just a bunch of really cool folks. Organizer/editor Zan Christensen’s concept for the book tackles some ideas I’ve never seen tackled before and I’m really excited to be a part of it. In several parts of the world ancient under ground living spaces have been found. Large ones as if the population anticipated some cataclysm they had to survive and avoid. Especially in the Middle East.